As a parent, you want the best for your child — now and at every moment of their lives. And a part of ensuring that long-term success is raising a son or daughter who has confidence. Children who are confident about themselves and their ability to handle new experiences are more likely to handle life’s complexities with resilience and long-term success. And a sense of competence and a can-do attitude will pay off in many ways as your son or daughter grows up and takes on life with enthusiasm. So, how can you help your child develop self-confidence? The secret is competence — the belief that we can accomplish something new right now because we have successfully mastered new situations in the past. In other words, young children who have many practical experiences of mastery and accomplishment, both big and small, are more likely to feel a sense of self-confidence in every area of like. This is an area where a Montessori education can be very beneficial, especially for preschool-aged children. The Montessori approach focuses on fostering those special moments of accomplishment and pride in academic, social, and practical skills. Here are seven ways that a Montessori education can help your preschool-aged child develop confidence for life. One of the best ways for a young child to develop a sense of confidence is to simply let the child be himself. Rather than trying to force your son or daughter to do things your way, encourage them as they pursue what interests them. A child with a strong sense of who they are as a person, including their passions and strengths, is more likely to be confident than a child who hasn’t developed a strong sense of themselves as individuals. In our classes, for example, students are invited to choose projects that spark their curiosity and creativity, to foster their sense of individuality. It’s all too easy to tell a child what to do, but in doing so, we don’t give our child practice in the vital, lifelong skill of decision-making. Even young children can begin to learn the process of thinking through a decision and considering what makes a wise choice. Rather than just asking your son or daughter to clean their room or put away toys, for example, chat with them about why these things matter. Ask them what they think, and allow them to come up with answers. This models critical thinking skills, which every child needs to develop. Parents are often tempted to do things for their preschool-aged child rather than giving the child a chance to practice new skills until they master them. But when you do tasks for your child instead of coaching them as they do it themselves, you rob them of the sense of competence. Montessori teachers coach young students in developing not just academic skills, but also practical skills like tying shoes, zipping up coats, and straightening up the classroom — all simple tasks that help children learn they can do things well with enough practice. An important element of confidence is a sense that we can pick ourselves back up when we fail, and try again. Failure is often a part of life, especially for preschool-aged children who are learning all sorts of new skills and facts for the first time. When we frame those failures for them in positive terms, it helps them to see that making mistakes and being imperfect are not the end of the world. Montessori classrooms are designed so that teachers can take time with students one-on-one to offer encouragement, and older students can also offer encouragement and help to younger ones. Often, young children feel strong emotions that they don’t even know how to name, much less channel. As parents and teachers, we can do much good for our preschoolers by acknowledging, accepting, and talking about emotions in a positive way. Rather than labeling an emotion as good or bad, or ignoring emotions that we don’t like, we can encourage children with the truth — emotions come and go, and they don’t have to be scary. Preschool aged children benefit greatly from clear, kindly but firmly enforced boundaries. Knowing what is acceptable and what isn’t is important for them, and it enables them to make good choices and feel secure in what is often a confusing, overwhelming world of new information. At home, you can set rules and stick to them — with kindness, of course! In the classroom, we do the same, so children always feel confident that they know how to be a successful student. From the time your child is very young, it’s a good idea to help them develop a sense of their own ability to make a difference. Children who are given regular opportunities to help others not only develop a sense of confidence and control, but they also develop empathy — a key social skill that will aid them in the classroom, on the sports field, with family and friends, and later on, at work and other adult pursuits. Montessori classrooms teach even the youngest children to impact their world by encouraging them to help each other with tasks like preparing for lunchtime and cleaning up afterwards. It’s simple, but it’s effective. Get Authentic Montessori and Boost Your Child’s Confidence. 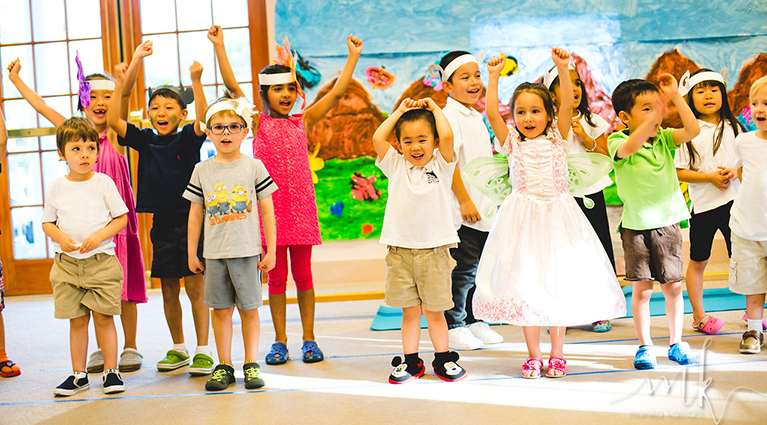 Primary Montessori is proud to offer an authentic Montessori education in Rockville, Maryland. So, if you’re a parent living in or around Rockville, and you’re looking for the best education for your child, we’d love to answer your questions and learn more about the benefits of a Montessori education. Contact us to schedule a tour of our facilities and meet our upbeat, experienced staff.